For other people with the same name, see Fred Stanley (disambiguation). Frederick Arthur Stanley, 16th Earl of Derby, KG, GCB, GCVO, PC (15 January 1841 – 14 June 1908), known as Frederick Stanley until 1886 and as Lord Stanley of Preston between 1886 and 1893, was a Conservative Party politician in the United Kingdom who served as Colonial Secretary from 1885 to 1886 and the sixth Governor General of Canada, from 1888 to 1893. An avid sportsman, he built Stanley House Stables in England, and is famous in North America for presenting Canada with the Stanley Cup. Stanley was also one of the original inductees of the Hockey Hall of Fame. Derby was the second son of Prime Minister Edward Smith-Stanley, 14th Earl of Derby, and the Hon. Emma Caroline, daughter of Edward Bootle-Wilbraham, 1st Baron Skelmersdale. He was born in London and was educated at Eton and Sandhurst. He received a commission in the Grenadier Guards, rising to the rank of Captain. Derby left the army for politics, serving as a Conservative Member of Parliament (for Preston from 1865 to 1868, North Lancashire from 1868 to 1885 and Blackpool from 1885 to 1886). In government, he served as a Civil Lord of the Admiralty (1868), Financial Secretary to the War Office (1874–1878), Secretary to the Treasury (1878), War Secretary (1878–1880) and Colonial Secretary (1885–1886). In 1886, he was created Baron Stanley of Preston, in the County Palatine of Lancaster. 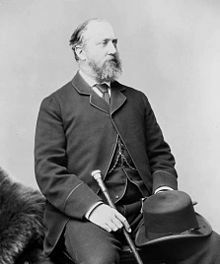 He served as President of the Board of Trade (1886–1888), remaining in that office until he was appointed Governor General of Canada. Stanley was appointed the Governor General of Canada and Commander in Chief of Prince Edward Island on 1 May 1888. During his term as Governor General, he travelled often and widely throughout the country. His visit to western Canada in 1889 gave him a lasting appreciation of the region's great natural beauty as well as permitting him to meet the people of Canada's First Nations and many western ranchers and farmers. During his visit he dedicated Stanley Park, which is named after him. He also experienced the joys of fishing and avidly pursued the sport whenever his busy schedule allowed. As governor general, Stanley was the third holder of that office to whom Queen Victoria granted the power of granting pardons to offenders or remitting sentences and fines and the power of mitigating capital or any other sentence. When Sir John A. Macdonald died in office of heart failure on 6 June 1891, Stanley lost the close friendship he had enjoyed with the Prime Minister. He asked Sir John Abbott to take over as prime minister. Once the government was in place, Abbott resigned for health reasons and turned the government over to Sir John Thompson. Stanley helped cement the non-political role of the governor general when, in 1891, he refused to agree to a controversial motion in the House of Commons. The motion called on him as governor general to disallow the government of Quebec's Jesuit Estates Act, which authorized paying $400,000 as compensation for land granted to the Jesuits by the King of France. The opposition to the bill was introduced by the other provinces who were motivated by mistrust of the Roman Catholic Church in Quebec. Stanley declined to interfere, citing the proposed disallowal as unconstitutional. In holding to this decision, he gained popularity by refusing to compromise the viceregal position of political neutrality. Stanley's wife, whom Sir Wilfrid Laurier described as "an able and witty woman", made a lasting contribution during her husband's term of office. In 1891, she founded the Lady Stanley Institute for Trained Nurses on Rideau Street, the first nursing school in Ottawa. She was also an enthusiastic fan of hockey games at the Rideau Rink. 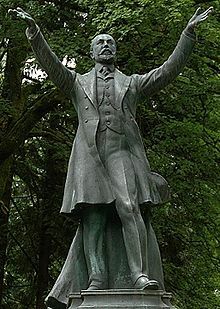 A statue of Lord Derby stands in Stanley Park, Vancouver. Stanley's sons became avid ice hockey players in Canada, playing in amateur leagues in Ottawa, and Lord and Lady Stanley became staunch hockey fans. In 1892, Stanley gave Canada a treasured national icon, the Stanley Cup, known originally as the Dominion Hockey Challenge Cup. He originally donated the trophy as a challenge cup for Canada's best amateur hockey club, but in 1909, it became contested by professional teams exclusively. Since 1926, only teams of the National Hockey League have competed for the trophy. This now-famous cup bears Stanley's name as tribute to his encouragement and love of outdoor life and sport in Canada. In recognition of this, he was inducted into the Canadian Hockey Hall of Fame in 1945 in the "Honoured Builders" category. The original size of the Stanley Cup was 7 inches (180 mm) and is now around 36 inches (910 mm) and 35 pounds (16 kg). Stanley's term as Governor General of Canada was due to end in September 1893. However, in April of that year, his elder brother, the 15th Earl of Derby, died. Stanley succeeded him as the 16th Earl of Derby. As a result, Stanley, now known as Lord Derby, left Canada on 15 July 1893 and returned to England. An administrator was appointed to fulfil his duties until Lord Aberdeen was sworn in that September. Also in 1893, Toronto's "New Fort York" (built in 1841) was renamed The Stanley Barracks in honour of Lord Stanley. Back with his family in England, he soon became the Lord Mayor of Liverpool and the first Chancellor of the University of Liverpool. Stanley Park, Liverpool is also named after him. In November 1901 Lord Derby was elected Mayor of Preston for the following year, and took part in the 1902 Preston Guild. During the last years of his life, he increasingly dedicated himself to philanthropic work. He helped fund the Coronation Park, Ormskirk, in 1905. Derby married Lady Constance Villiers, daughter of George Villiers, 4th Earl of Clarendon, on 31 May 1864. She was born in 1840. They had eight sons and two daughters (of whom one son and one daughter died as children). Her Ladyship remained and several of their children lived in Canada throughout his term as Governor General. She was responsible for the foundation of the Lady Stanley Institute for Trained Nurses in Ottawa, Ontario, as well as a Maternity Hospital. She was president of the $4,000 fund instituted by the women of Canada for the presentation of a wedding gift to the present Prince and Princess of Wales: a sleigh, robes, harness and horses and a canoe. In 1890 Prince George of Wales (the future King George V) was their guest at Rideau Hall. In 1903 King Edward VII was their guest at their residence, St. James Square, London, England. Their second son, the Hon. Sir Victor Stanley (1867–1934), was an Admiral in the Royal Navy who married a Canadian lady, the daughter of Hon. C. E. Pooley, KC, of British Columbia. Their third son, the Hon. Sir Arthur Stanley, and sixth son, the Hon. Sir George Frederick Stanley, were both politicians. Their fourth son, the Hon. Ferdinand Charles Stanley, was educated at Wellington and Sandhurst, before joining the King's Royal Rifle Corps in 1891, rising to the rank of Brigadier-General. He married the Hon. Alexandra Fellowes, the eldest daughter of the Baron de Ramsey; they lived at 8 Cornwall Terrace, Regent's Park, London, now renamed Stanley House. Their daughter, Lady Isobel Gathorne-Hardy, was their longest living child, living until 1963. She was instrumental in convincing her father to create the Stanley Cup. She is mentioned in one of the first games of women's hockey, played at Rideau Skating Rink in 1899. Her role as a women's hockey pioneer is recognized in women's hockey with both with the Isobel Gathorne-Hardy Award, given across women's hockey in Canada, and the Isobel Cup, the National Women's Hockey League's championship trophy. Derby died on 14 June 1908, aged 67, and was succeeded by his eldest son, Edward, who also became a distinguished politician. Lady Derby died on 17 April 1922. After Edward Whymper made the first ascent of Stanley Peak in 1901, he named the mountain after Lord Derby. Vancouver's Stanley Park and Stanley Theatre were also named after him, as was Stanley Park, Blackpool. The Preston Squadron of cadets at the Royal Military College Saint-Jean was named in his honour. Stanley Park, an area that famously separates the home grounds of English Premier League football teams Liverpool F. C. and Everton F. C., was named after him. Stanley House Inn, named for Lord Stanley and was built as his summer residence in 1888 along the Cascapedia River. The Dominion Hockey Challenge Cup is today known as the Stanley Cup and is awarded to the winning team of the National Hockey League playoffs each season. In October 2017, a monument commemorating the donation of the Stanley Cup was erected in Ottawa at Sparks Street and Elgin Street, near the location of the dinner party announcing the Cup at the Russell House, which has since been demolished. Stanley Quay, later renamed Stanley Street, in Brisbane, Australia, was named after him at the time he was Colonial Secretary. ^ a b c d e f g "Canada's Executive Head; Power and Emoluments of the Governor General. Almost Unlimited Authority Granted to Him – An Expensive Luxury for Canadians Who Want to Choose Their Own Governor," New York Times. 5 November 1891. ^ Grand Lodge of British Columbia and Yukon: A few famous freemasons. ^ "Election of Mayors". The Times (36609). London. 11 November 1901. p. 7. ^ Broady-Hawkes, Dot (21 June 2015). "Ormskirk Nostalgia: Happy birthday to Coronation Park – 120 years old this month". Southport Visitor. ^ Morgan, Henry James, ed. (1903). Types of Canadian Women and of Women who are or have been Connected with Canada. Toronto: Williams Briggs. p. 323. ^ "Cornwall Terrace". Archived from the original on 12 October 2012. ^ "Biographies". CBC.ca. Retrieved 29 September 2009. ^ Mathison, Emily. "Things That Go Bump in the Night: Unearthly spirit sightings at a local landmark" Archived 29 December 2006 at the Wayback Machine Retrieved on 9 May 2008. ^ "Invitation: Monument Unveiling". lordstanleysgift.com. 18 October 2017. Retrieved 13 November 2017. ^ "Stanley Peak British Columbia #1538". Bivouac.com. Archived from the original on 21 March 2016. Retrieved 12 June 2012. ^ Peakware.com (ed.). "Stanley Peak". Peakware World Mountain Encyclopedia. Retrieved 12 June 2012. ^ "Peak Stanley". Peakfinder.com. Retrieved 12 June 2012. Waite, P.B (1994). "Stanley, Frederick Arthur, 1st Baron Stanley and 16th Earl of Derby". In Cook, Ramsay; Hamelin, Jean (eds.). Dictionary of Canadian Biography. XIII (1901–1910) (online ed.). University of Toronto Press. Wikimedia Commons has media related to Frederick Stanley, 16th Earl of Derby.